Those of you with little Mike The Knight fans will be glad to know that there is a new DVD out just in time for Christmas. Discover the world of Glendragon this Christmas and enjoy more knightly adventures than ever, in this new two disc DVD collection from CBeebies favourite, Mike the Knight: A Very Knightly Christmas includes six fun and festive episodes. It’s Christmas Eve in Glendragon and one of Santa’s reindeer is sick. Mike makes it his mission to save Christmas and does everything he can to nurse the reindeer back to health, making sure he is included on Santa’s ‘nice’ list. Meanwhile, Mr Cuddles is sent on a wild toboggan ride, Squirt gets stuck in a giant snowball and Mike learns that Vikings like to have fun in the snow too. Little knights-in-training can also follow in the footsteps of their medieval hero with a host of DVD extras. This includes a fun modern day version of the chivalrous code and a sing-along theme tune. Mike the Knight: A Very Knightly Christmas also comes with a special bonus DVD, Mike’s hidden Treasure, containing six additional episodes. Huzzah! My kids are both huge Mike The Knight fans and once again we're delighted with the latest DVD. The episodes are short and sweet and the addition of the bonus disc means I won't have to watch just Christmas episodes for the next six months! 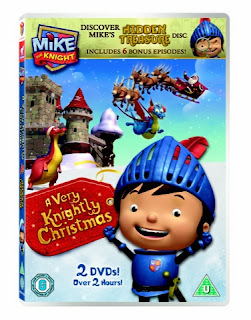 Mike the Knight: A Very Knightly Christmas is available at all good DVD retailers. We were sent this DVD free of charge for the purpose of this review. All opinions are my own.